Text expansion utility. Type as few as two characters and ShortKeys will insert words, sentences, paragraphs or pages of text into your application. Great for repetitive text needs. Automate tedious and repetitive typing. Reduce errors. Simply choose a text string and associate it with the replacement text. See how much time you can save by using ShortKeys. It's quick and simple! You'll wonder how you ever survived without it. 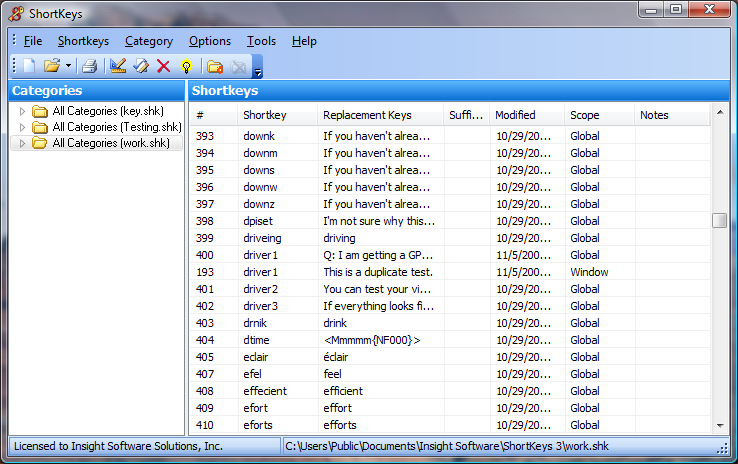 Text expander tool to insert frequently used text snippets into other programs. ...... Enter virtually an unlimited number of replacement text combinations per file. More than one file may be loaded at the same time. To make it work, just run ShortKeys and all word and replacement combinations are active. ShortKeys runs hidden in the background. When a shortkey is typed, it is erased and the replacement text is inserted in its place. It's quick and simple! You'll wonder how you ever survived without it. Anyone performing repetitive typing will immediately recognize the benefits of ShortKeys. Quickly insert personal information such as Name, Address, Phone, Fax or Email into documents, forms, email, etc. Create boilerplate text for professions such as Legal, Medical, Dental, Insurance, Banking or Real Estate. Qweas is providing links to ShortKeys 3.2.2.1 as a courtesy, and makes no representations regarding ShortKeys or any other applications or any information related thereto. Any questions, complaints or claims regarding this application ShortKeys 3.2.2.1 must be directed to the appropriate software vendor. You may click the publisher link of ShortKeys on the top of this page to get more details about the vendor.